Similar to adding custom fields to tickets, you can add custom fields to user profiles to store additional customer details. Any custom user fields you create apply to all users. Administrators can create custom fields for users. Custom user fields are visible and editable for agents, but not end-users. Custom user fields are not available on the Essential plan. You can use custom user fields in your triggers and automations (see Leveraging user and org fields with business rules ). You can use placeholders to reference custom user fields in macros, ticket comments, and notification messages (see Placeholders for custom fields ). Custom user fields are also searchable (see Searching custom user and organization fields ). Professional and Enterprise customers can report on custom user fields in Insights. For details, see Reporting on custom fields in Insights . Note: You can also add custom fields to organizations (see Adding custom fields to organizations ) and tickets (see Adding custom fields to your tickets and support request forms). You can also watch this short video. Tip: Be sure to check out these user and organizational fields recipes in our Support Workflows Cookbook : Software support , Internal IT , and Retail business . Also, for more custom user field recipes, see our Customer-centric cookbook . Share your recipes ! Click the Admin icon ( ) in the sidebar, then select User Fields . Select a custom field type on the right, then drag it to the active fields area and place it where you want it to appear. Alternatively, click the Plus sign (+) beside the field type you want to add. The order of your active custom fields here is the same order they will appear in each user profile. For more information about the field types, see About custom field types . When you add the field type, the properties panel opens. Enter a Field title shown to agents and a Field key in the properties panel on the right. When you enter data in one of these fields, the other field automatically populates. You can edit either field, however, if you want them to be different. 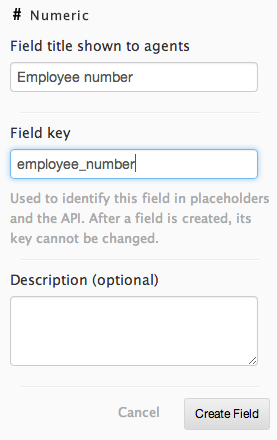 You cannot change the field key after you create the custom user field. The field key is used by the API and Liquid placeholders, and it is the only field setting that is not editable after it is set. Set other properties for your field. Options vary depending on the type of field you are adding. If you are adding a drop-down list, you can have up to six levels of organization (see Organizing drop-down list options ). New user fields are active by default and are added to all users. You can manage your custom user fields in the User Fields admin page. In the User Fields admin page, click the name of the custom user field you want to edit. Edit settings in the properties panel on the right. In the User Fields admin page, click the name of the custom user field you want to delete. Click Delete in the properties panel on the right. When you delete a custom user field, that field and any associated data is removed from all users. The data is preserved only if the custom field also adds a tag to a user. The two custom fields that add tags are the drop-down list and the checkbox. If you delete one of these custom fields, then the data in users persist as tags. Click OK to confirm that you want to delete the custom user field. The custom user field and any associated data is removed from all users. In the User Fields admin page, hover over the custom user field you want to activate or deactivate, then select Activate or Deactivate . The field moves to the active or inactive section depending on the action you selected. In the User Fields admin page, hover over the custom user field you want to clone, then select Clone . A duplicate user field is created, and the properties panel opens on the right so that you can edit the settings. Is it possible to collect the IP or at least, the country of the user with this method ? At present there isn't any way you can automatically collect IP or country of the user and have it pushed through to a correspondingly custom user field on the user profile. You can however create a custom field for country or IP and then your agents can manually submit the details for this on the profile when needed or available to them. Is it possible to make a user field required for an agent to create a user? I need to segment end users by internal, external and vendor and have those as user fields. If users are created by sending an email, no control there but I'd like to require the field if an agent creates a user. Possible? @Amy, no there is no way through the GUI to make user fields mandatory and I cannot think of any app already in the marketplace that would do this successfully. However, if you had the time and/or capability you could create an app that checked the user field value when trying to submit a ticket. If your user field is a text field, you may type in there the text that you set on the text field. It would be great if end users had the ability to edit select custom user fields by editing their profile via the Help centre. Additionally to be able to register/create an account and be required to provide this data. We use Zendesk as our primary CRM as there is no other business need for anything else. So our users register using a html form that pushes the data to Zendesk, MailChimp and a couple of other places (dependant upon the details supplied during registration) via API. This makes edits and updates an interesting challenge ad most of the updates are done via agents using Zendesk but users can reregister and update their info, edit via mailchimp etc. So it would be great to keep all the edits to Zendesk and use the API and webhooks to update our non-core services. How would I restrict the keyword search you detailed to only look for userfields instead of all keyword locations? Using the function "type:user" will prevent all the ticket data from appearing, however looking under the user tab on a normal search will show you the relevant users which apply to the keywords that you entered. I would like to add a phone number to the User record. Do I simply use a text field or can the regular expression be used? If so, how? Is it possible to populate a numeric field via the API /a URL target extension? If you want to add the phone number from the agent interface, you don't need to add a custom field. In the User Profile click Add Contact and select Phone. If you want your end users to be able to add their phone number from the Submit a Request form in your Help Center, you can add a custom field for this really easily, as you'll see outlined in the article above. You'll have the option to use a regular text field, or you can use a Regular Expression - both of those are options for your custom fields. Is there any way to push a custom user field into a ticket automatically. The scenario is we'd like to add the users department to their user profile and we'd like this to be automatically to each ticket that they may create. If it is possible please can you advise me how this can be achieved. When you say you'd like to push a custom user field into a ticket, are you wanting to have the value of that user field added to the description in the ticket? Or are you wanting a custom User field to be reflected as well in a custom Ticket field? For either case, you would only be able to do this using a predefined custom user field such as a drop-down field or a check box. If it's the latter situation above that you're looking to do, you'll need to make a custom Ticket field that corresponds to the values in that User field, and then make a trigger to set the Ticket Field value to whichever the User field value is set. If you're hoping to have that field value populated into the ticket description, you would need to make a ticket field trigger such as like the first scenario and then also setup a macro that uses the a custom ticket field placeholder to populate that data into the Description box on the ticket. I hope that all makes sense, but let me know if I've misunderstood anything in regards to your question, or if there is anything I can clarify further. Justin, I'm working on a similar idea to Simon's and I'm stuck. We'd like to have use a custom user field drop down AND have it show on each ticket. The two would update each other. I played around with your suggestions and didn't get anywhere. We're attempting to mark the "personality type" of the requester so we better know how to communicate with them. The agents may not remember to look at the user's info, but of course will always see the tickets. So it would be great if it showed in both places. When I add new user, on the popup window, custom field is not shown. How do I make custom fields shown on the popup window? There are just Name, Email, and Role. I have some custom fields on user, phone number, title,,,,, and so on, and I'd like to enter this info when I create new user. You'd be able to use Justin's solution to populate a custom ticket field based on a custom user field, but it's not possible to do it the other way - user profiles cannot inherit data from a ticket. Custom dropdown and checkbox fields generate a tag based on the selection you made. When you do this in a user profile, that tag automatically is added to any tickets that user submits. As Justin suggested, you can create a corresponding dropdown menu on your ticket form and set up a series of macros to set that ticket dropdown based on the user tag the ticket inherits. It'll require making sure someone sets the value in the user profile when a new user first submits a ticket, but once that's done the rest of the process will be automatic. Let us know if you need any clarification! It's not possible to display any additional fields on the Add User pop-up window. In order to populate those fields you'd need to go into the User Profile itself. I did some digging around in our Product Feedback forum, but I didn't find any threads about this. I'd recommend heading over there to share your suggestion and detailed use case to make sure our Product Managers see it! Is there no way to have end users select their data for a user field? At the moment, we have a custom ticket field for most tickets that requires end users to select their Service from a drop-down menu. It would be much simpler for end users to simply have to select their service once, which is stored as a user field. The two alternatives we seem to be looking at instead of this are either having to have end users repeatedly answering the same question every time they create a ticket (the system we are using currently) or having to have an agent check each ticket for if the user is new, and if so manually populating the user field "service" with the correct information. The second option would also require the back-cataloguing of the many end users that we have already. Is there any way of making this simpler for end users without adding extra workload to our agents? At this time custom user fields are not editable by end-users. If you add a tag to end-user profiles tickets they submit will inherit that tag. You can match that tag to your custom ticket field values (dropdown) and it will get automatically set on that ticket because of that tag. You can read more about this tag / ticket field interaction here: Understanding custom ticket fields, tags, and business rules. I'm struggling to understand the difference between custom fields and custom user fields when both are "visible and editable for agents, but not end-users", what are the benefits? I'm exploring ways to offer internal company end-users to have permission to change the value of a custom field (a checkbox) but continue to restrict this functionality from external end-users. Custom fields will be located in your tickets. User fields are located in an end-user's user profile in your agent interface. In both cases, they give you the option to customize the information that's captured for agent reference. Any tags that are added to the user profile (ie: via check boxes or drop-downs) will also be added to any tickets that user submits. Hey Jessie - Apologies just noticed this.. yes this is super helpful thank you! Would be nice if there was an option to make the fields visible to the customer in their profile. Whilst custom user profile fields are not currently visible to end-users, there is a workaround to this you could look at using. You can use triggers to map a custom ticket field to a custom user field. This would allow the end-user to submit the product and version info on the ticket at the time of submission and from there the corresponding field on the user profile would be updated automatically. Below is an example of a trigger which would achieve this for you, providing you already have both fields set up in your Zendesk. We have a case where some users prefer to hav the full ticket history in their emails, where others would prefer to just have the last comment. We are using the below string in our trigger, which works really well, however as end-users can not edit custom user fields, it means that they can't self serve with their preference. Is there a work around for this, or any chances that we might see Custom User fields become end-user editable? We are wanting to use this for multiple scenarios, for example, giving users the option to opt out of satisfaction surveys, choose default formatting, etc. I'm trying to use the Glance app within Zendesk. It says I need to add the necessary custom fields to your Zendesk. The first field is a User field that stores an agent's Glance username. I can't find the custom user field that stores my Glance username. Any ideas? Have you created the custom field yet? For apps that require a custom field of some kind, you need to actually create that field yourself. The app doesn't automatically create it for you. Go to your Settings by clicking the cog at the bottom left of your Zendesk screen. In the Manage section, click on User Fields. Click on a new Text field. For Field title shown to agents enter Agent Glance Address. For Field key enter glance_address. For Description enter Agent Glance Address used by Glance sidebar app. Click on the cog icon on the bottom left corner of Zendesk. In the Manage section, click People. Open an agent profile that you would like to use Glance with. Find your newly created Agent Glance Address field on the bottom of the left-hand pane and enter the agent’s Glance address (For example, darren.glance.net). Repeat this process for all the agents that you would like to use Glance with. Can I add custom fields to my end user's request page?